The weather was perfect for our expedition of hope. We were lead by Dr. Jeff Sutherland and his wife Darlene who cut the starting line ribbon. 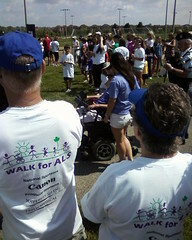 It was a great show of support for Dr. Sutherland and all in our area who suffer from ALS. My thanks to everyone who walked on Saturday and for everyone who sponsored us who walked. Previous Post Empty Bank Accounts Made Full!